Platelet may be performed by manual or automated methods. Automated platelet counts are more accurate. Platelet counts are best performed on EDTA-anticoagulated blood obtained by venepuncture. Capillary blood may be used. Counts obtained by capillary blood are lower and show a greater variability. Platelets change shape on coming in contact with EDTA from discoid to spheroid with filamentous extensions. The volume of platelets remains unchanged for about 1-2 hours but increases thereafter by about 7.9% at 30 minutes and 13.4%at 24 hours (Clin Lab Haematol. 2005;27:370-373). It is best to minimize the delay between collection and counting. Manual platelet count is performed by diluting blood by a solution containing 1% ammonium oxalate and counting the number of platelets in a Neubauer chamber. Blood is diluted 1:20 with 1% ammonium oxalate to lyse the erythrocytes. If the platelet count is performed under natural light then brilliant cresyl blue is used to stain platelets and make them more visible. The diluted blood is mixed for 10-15 minutes. The Neubauer chambers is filled with diluted blood and left in a moist petri dish for 20 minutes to allow the platelet to settle down. The platelets may be counted under normal light or under phase contrast. Platelets are visualized better under phase contrast. The condenser needs to be racked down while counting platelets. Platelets appear as small refractile bodies. Dust particles can be confused with platelets and the equipment and reagents used for platelet counting must be dust-free. If accurate erythrocyte count is available the platelet count may be performed by count the proportion of platelets to erythrocytes in the thin part of the peripheral smear and estimating the platelet count as a proportion of the erythrocyte count. Automated counters count platelets by impedance, light scatter, optical fluorescence or by the use of monoclonal antibody to platelet glycoproteins (see Principles of Automated Cell Counts). Impedance counters Impedance counters count platelets by the change in impedance they produce while passing through an electric field. The degree of change is proportional to the volume of the cell. Platelets are separated from erythrocytes by size, the cut-off being 30fl. Large platelets may (e.g. those seen in May-Hegglin anomaly) may not be counted and erythrocyte fragments may be counted as platelets. Light Scatter Laser light scattering patterns of cells depending on their shape and reflectivity. Cells are passed under a laser beam and their light scattering patterns determined. Cells are characterized according to these patterns. Monoclonal Antibody Platelets can be counted by immunofluorescence using the monoclonal antibodies CD41, CD42a or CD61. Usually a combination of CD41 and CD61 us used to eliminate errors that may occur because of the lack of one antigen on the platelet surface membrane. Mean Platelet Volume (MPV) MPV is a reflection of megakaryocyte ploidy. MPV is increased in conditions associated with increased platelet turnover. The platelet mass remains constant in normal individuals.. The MPV falls with increasing platelet counts in a non-linear manner. The effect of storage in EDTA on MPV depends on the method used to perform the platelet count. The MPV increases if measured in an impedance counter because of a change in volume of platelets (see above). When measured by optical methods the MPV decreases nearly 10% possible because of a fall in the refractile index of the platelets because of dilution of cytoplasmic contents. Platelet Distribution Width (PDW) PDW is the variability in the size of platelets. Normally PDW increases with MPV. In patients with megaloblastic anaemia, aplastic anaemia and those on chemotherapy the relationship between MPV and PDW is lost. The patients show a low MPV but a high PDW. Reticulated Platelets Freshly released platelets have RNA that is lost in 24-36 hours after release. These are known as reticulated platelets and can be counted by counters by using a RNA banding dye. Reticulated platelet count, like reticulocyte count, is an index of platelet production. The normal range varies from <3% to 20%. Reticulated platelet counts are useful in distinguishing thrombocytopenia from peripheral destruction from that due to decreased production. It has a reported sensitivity and specificity of 95%. Partial clotting of specimen with activation and aggregation of platelets during venepuncture. Platelet Satellitism: Platelet statellitism is phenomena in which platelets encircle neutrophils. It is usually seen in blood collected in EDTA but may be seen with other anticoagulants and is caused by IgG or IgM antibodies that bind the CD16 antigen. 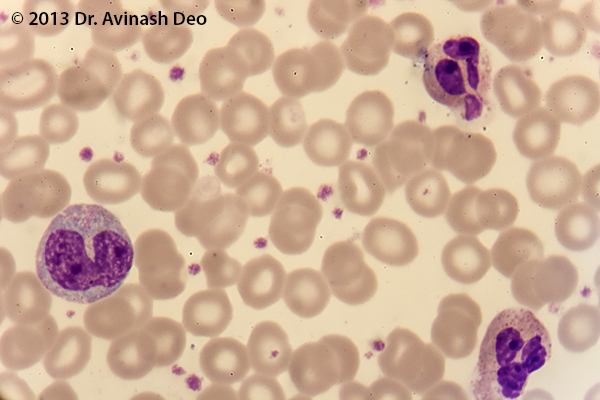 Satellitism around other leucocytes may be seen and some platelets may be phagocytosed. Giant Platelets Impedance counters separate platelets from erythrocytes by size. Large platelets may not be counted as platelets but as erythrocytes. Patients whose peripheral smears a significant number of large platelets should have a manual platelet count. Severe Microcytosis or Fragmentation of Erythrocytes: Erythrocytes are separated from platelets by size. Small erythrocytes or erythrocyte fragments can be counted as platelets giving a falsely elevated count. Cryoglobulinaemia: Pseudothrombocytosis and pseudoleucocytosis has been reported in patients with cryoglobulinaemia. Haemoglobin H disease has been associated with pseudothrombocytosis. Performing a platelet count no-anticoagulated blood collected by finger prick. Variations in Platelet Size: It is impossible to get an accurate automated platelet count in patients with a large number of giant platelets. Manual platelet counts should be performed in such patients. The patients should be informed of this discrepancy to prevent him/her from undergoing investigations for “thrombocytopenia”. Pseudothrombocytosis due to severe microcytosis or erythrocyte fragments is rare. These patients also need a manual count.